This painting is the finest and most compelling portrait of Elizabeth I before her accession. It conveys her beauty, dignity, gentleness and learning. Although it was probably painted for her father, Henry VIII, it is first recorded in the collection of her half-brother, Edward VI, where it is described as 'the picture of the Ladye Elizabeth her grace with a booke in her hande her gowne like crymsen clothe'. In 1547 Princess Elizabeth sent a portrait of herself to her brother (the future Edward VI) accompanied by a letter. This was probably not this particular portrait, but the sentiment in the letter indicates the princess' attitude to having her portrait painted. She described the portrait as 'the outwarde shadow of the body' and expressed a wish that her 'inwarde minde' could be more often in her brother's presence. The piety of this 'inwarde minde' is conveyed in this portrait, where the simplicity of the princess' pose is enriched by the inclusion of two books. The smaller book probably alludes to the New Testament, and the larger book to the Old Testament. The princess's costume is meticulously painted, drawing attention to the richness of the fabric of her dress and jewellery. This portrait seems to be a pair to one of Edward VI (RCIN 404441). The style is similar and the wooden panels on which the works are painted derive from the same tree. It has been suggested that the painter of these two works was William Scrots, an artist from the Netherlands who was employed by Henry VIII from 1545 and remained on the royal payroll until the accession of Mary I in 1553. Elizabeth's gown is constructed of a crimson silk fabric woven with a pomegranate pattern. The artist has also included tiny parallel lines of gold indicating that it was also woven with precious metal threads. The triangular forepart at the front of her skirt and undersleeves are made of a more expensive fabric known as cloth-of-silver tissued with gold. Massed groups of gold loops are shown in a pomegranate pattern against a pale silver-coloured ground. Tissued fabrics like this were reserved by sumptuary law to the king and his closest relatives. 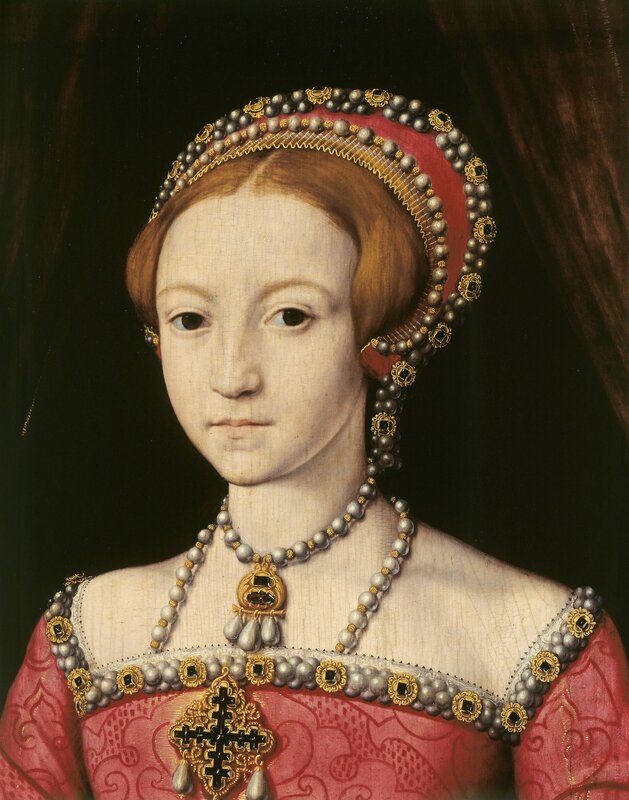 By depicting such a restricted fabric, the portrait apparently makes a conscious references to the princess's royal birth - potentially a politically charged statement given that it was painted in c.1546, only three years after the Third Succession Act had brought her back into the royal line of succession (although she was still officially declared illegitimate). Probably painted for Henry VIII. First recorded in the 1547 inventory of Edward VI.